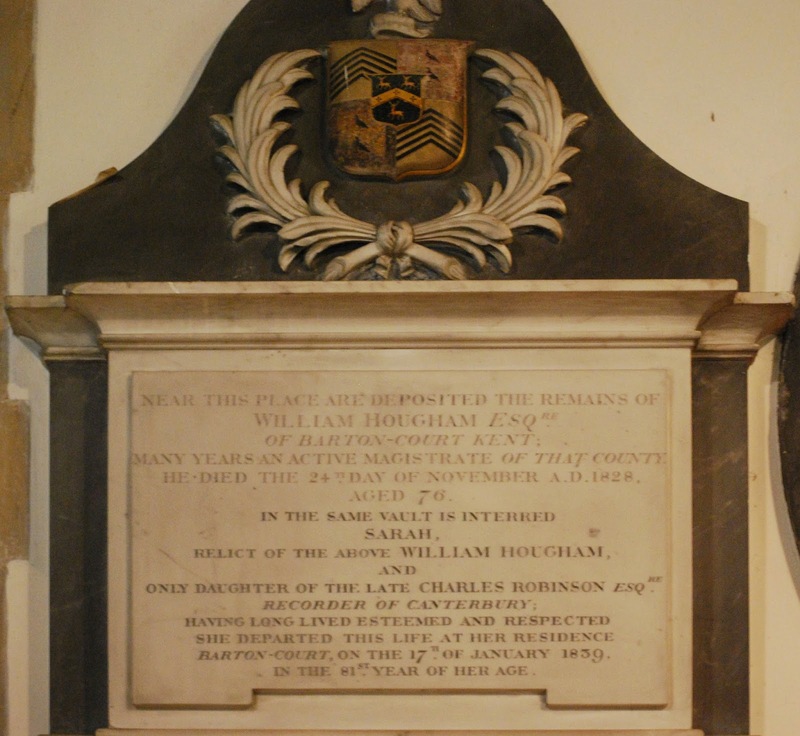 Another heraldic memorial at St. Martin's Church in Canterbury, England, was erected in memory of a married couple, William Hougham, Esq. of Barton-Court, Kent (ca. 1752 - 1828), and his wife, Sarah (Robinson) Hougham (ca. 1758 - 1839). It's a nice, stately memorial, but of course the part that most attracted me was the heraldry its apex. The arms in the first and fourth quarters of the shield appear to be a variant of Hougham of Barton House, Kent (Solomon Hougham, Esq. of Barton House was Sheriff of Kent in 1696), descended from Robert de Hougham in the time of Richard I, Argent five chevronels sable. On the memorial, the field appears to be or (gold) rather than argent (silver). The crest is given in Burke's General Armory as On a chapeau gules turned up ermine a falcon argent with wings expanded or beaked and belled of the last. The second and third quarters are difficult to decipher with confidence; the second quarter appears to be painted mostly gules, but it is possible to make out what looks like a bordure gules on it. The third quarter might be Or in pale two (birds) within a bordure sable, but a close examination of the bordure makes it appear that there spots of red on it, which might (or might not) be charges of some sort. 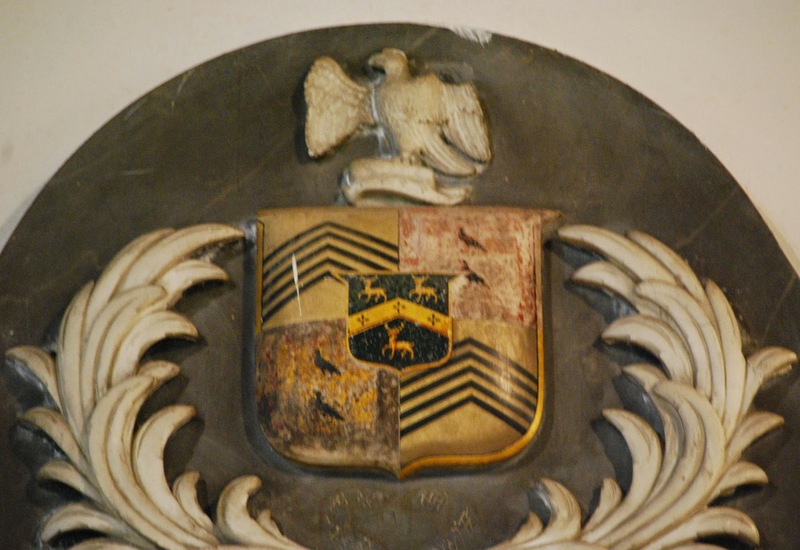 Papworth's Ordinary of British Armorials does give the arms of Corbet, Or (and in one instance, argent) two ravens in pale proper within a bordure gules, so that is certainly a possibility here. On an inescutcheon of pretense we have a version of the arms of Robinson. There are a number of similar variants in Burke, Sable, on a chevron between three stags passant (some statant, some at gaze) or three (quatrefoils, trefoils slipped, cinquefoils) gules. I believe the charges on the chevron here are either quatrefoils or trefoils slipped. Still and all, for all the heraldic confusion about the depiction of the arms, it's a wonderful memorial to a this married couple from Canterbury, Kent, England.